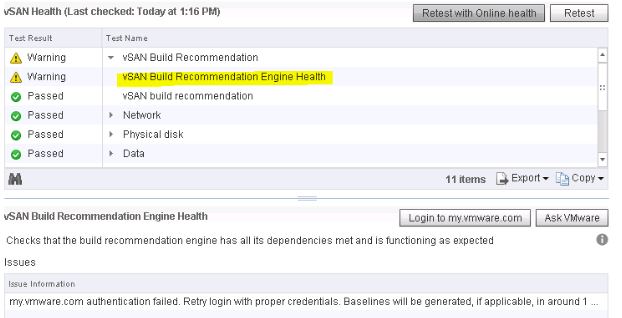 vSAN build recommendation is one of most important vSAN health check provided in vCenter webclient. This health check provides build recommendations based on the existing state of vSAN cluster. vSAN’s build recommendations for Update Manager require that Update Manager is available. The build recommendation engine relies on the VMware Compatibility Guide and VMware release metadata. Internet connectivity and valid My VMware (my.vmware.com) credentials are required to download and provide build recommendations. However, after completing all the prerequisites still some administrators are facing issue with health check. I have noticed one issue where internet access is enabled in webclient, proxy settings are correctly configured & HCLDB is getting updated regularly. In order to fix this issue, I have gone through all the prerequisites and process again to make sure nothing is missed. After entering the username and password for 2 minutes health check went green but it became warning again stating the same. Checked internet connectivity by selecting vSAN cluster ⇒ Configure ⇒ General. Internet access is enabled and proxy settings are configured. Opened web-browser and logged in to website my.vmware.com, checked that credentials are working fine for my account and it should work to pass the health check too. Connecting to www.vmware.com| failed: Connection refused. Connecting to www.vmware.com| failed: Cannot assign requested address. Connecting to www.vmware.com|failed: Cannot assign requested address. 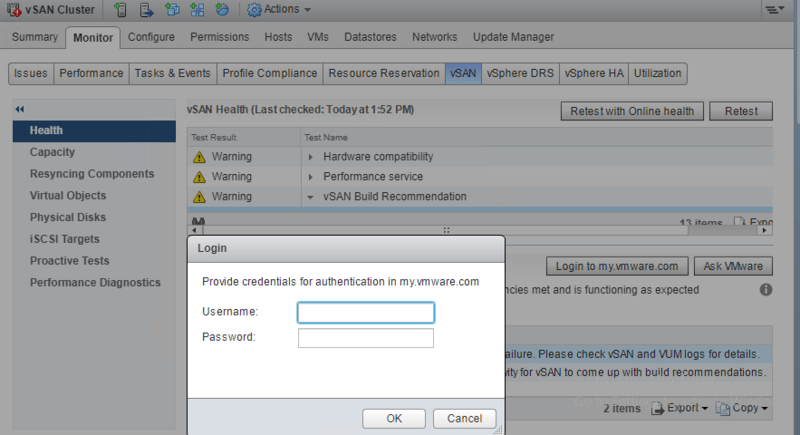 Again, logged into webclient and in health check entered credentials for my.vmware.com. Authentication wizard accepted the credentials & warning never came back. In vCenter VAMI page, same proxy settings can be configured through command line by editing “proxy” file /etc/sysconfig/proxy. Wow! Nitesh, This is definitely useful to get rid of the annoying alert from Health monitor. Thanks for the content.